NOAA’s Annual Greenhouse Gas Index, which tracks the warming influence of long-lived greenhouse gases, has increased by 41 percent from 1990 to 2017, up 1 percent from 2016 -- with most of that attributable to rising carbon dioxide levels, according to NOAA climate scientists. The greenhouse gas index is based on precise measurements of gases in the atmosphere, which are collected from a network of sites around the globe and analyzed at NOAA’s Earth System Research Lab in Boulder, Colorado. The index is proportional to the change in the direct climate-warming influence (also known as climate forcing) exerted by five primary greenhouse gases since the onset of the industrial revolution. “The greenhouse gas index is based on highly accurate measurements and long-established principles of physics, so it tells us how we are raising the amount of heat trapped in the atmosphere right now,” said James Butler, director of NOAA’s Global Monitoring Division. NOAA scientists introduced the Annual Greenhouse Gas Index in 2006 as a way to help policymakers, educators and the public understand the influence exerted by greenhouse gas levels over time. Called the AGGI for short, it is updated each spring when air samples from all over the globe for the previous year have been obtained and analyzed. The AGGI tracks carbon dioxide, methane, nitrous oxide, and two chlorofluorocarbons that were banned by the Montreal Protocol because they damage Earth’s protective ozone layer. These five primary greenhouse gases account for about 96 percent of the increased climate warming influence since 1750. The index tracks five primary gases: carbon dioxide, methane, nitrous oxide, and two chlorofluorocarbons that were banned by the Montreal Protocol because they damage Earth’s protective ozone layer. These five primary greenhouse gases account for about 96 percent of the increased climate warming influence since 1750. Fifteen secondary greenhouse gases also tracked by the AGGI account for the remaining 4 percent. Scientists who created the AGGI assigned a value of zero to the year 1750, marking the onset of the industrial revolution. Analysis of air trapped in ice and snow in Antarctica by NOAA and others demonstrate that after this date, atmospheric carbon dioxide concentrations departed from a relatively stable 280 parts per million observed during the previous 10,000 years, climbing to 354 parts per million in 1990 and 405 parts per million by the end of 2017. Since 1750, the concentration of carbon dioxide in the atmosphere has risen 46 percent. In April 2018, CO2 levels at NOAA’s Mauna Loa baseline atmospheric observatory averaged 410 ppm. This graphic shows the direct climate influence of the five primary and 15 secondary greenhouse gases tracked by the Annual Greenhouse Gas Index over time. Carbon dioxide is the most important of the measured gases, which exert a cumulative influence equivalent to 489 parts per million of CO2. 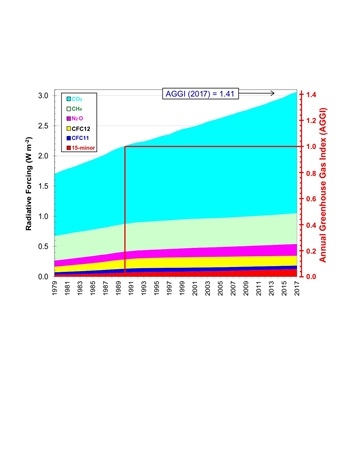 An AGGI value of 1.0 was assigned to the year 1990, which was the baseline year of the Kyoto Protocol, an international treaty calling for the reduction in greenhouse gas emissions. In 2016 the AGGI was 1.40, in 2017, the AGGI rose to a value of 1.41. Carbon dioxide, or CO2, is by far the most important greenhouse gas in both total amount and rate of increase, and is responsible for 80 percent of the increased warming influence captured by the AGGI since 1990. 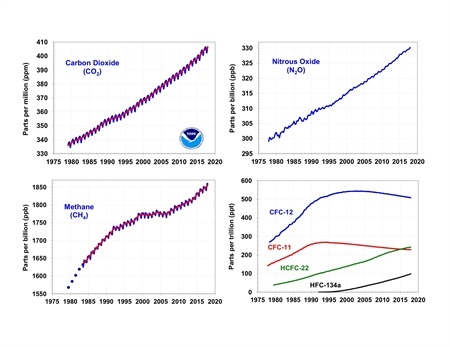 During 2017, NOAA’s Global Greenhouse Gas Reference Network Measurements showed that concentrations of CO2 in the atmosphere rose by 2.3 parts per million, following record increases of 2.9 ppm in 2016 and 2015. This is the sixth consecutive year CO2 rose by 2 ppm or more. Prior to 2012, back-to-back annual increases of 2 ppm or greater occurred only twice. The direct warming influence exerted by all five primary and 15 secondary gases measured by the AGGI are equivalent to the warming influence of 493 ppm of CO2. The globally averaged annual temperature during 2017 was third-warmest in NOAA's 138-year global temperature record, behind 2016 and 2015. Each of the five of the warmest years have occurred since 2010. Each of the 10 warmest years have occurred in the past 20 years. All 18 years of the 21st Century rank among the 19 warmest on record. Record warmth was observed across parts of the western and central Pacific Ocean, western Indian Ocean, southern South America, and the southwestern contiguous U.S. and scattered across parts of the northern Atlantic Ocean, Africa, the Middle East, and eastern Asia. For the contiguous U.S., 2017 was also the third warmest year since that data began to be recorded in 1895, coming in behind 2012 and 2016. It was the 21st consecutive warmer-than-average year for the U.S. The five warmest years on record for the contiguous U.S. have all occurred since 2006. For the third consecutive year, every one of the contiguous U.S. and Alaska had an above-average annual temperature. During 2017, Texas experienced its warmest winter on record, California and Nevada experienced the warmest summer in 123 years, while Arizona, New Mexico, Maine, New Hampshire, Massachusetts and Connecticut all experienced the highest average fall temperatures on record. During 2017, the maximum extent of Arctic sea ice set a record low for the third straight year. Access the complete AGGI for 2017 online.